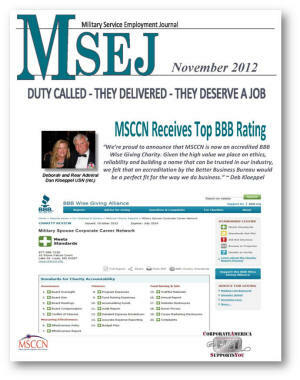 Check out the November 2012 Military Service Employment Journal from MSCCN. Career Advice: Do you look at yourself as a business? If you want a successful business, you first have to have a business plan. The same rules apply to a career plan you should apply to your "Professional Self". Portable Careers: Tired of Changing Careers? Try just moving it! What is the definition of a portable career? A portable career is a career in which you are not bound to stay in one location. It's a career that allows you the freedom to decide where you want to live, be it a new city, a new state, or a new country! It's a job that goes and grows with you. As a military spouse, you are not guaranteed to be in the same place for a long time. Duty calls, not just for the service member, but for the entire family. The spouse is the one that needs to be able to hold it all together and keep things running right. Once you get a job, you dread the day that you have to walk into your boss's office and explain to him that orders have come in for your entire family, because that's the way it is. Your children have to say goodbye to their schools, friends, teachers, and you have to say goodbye to your friends, co-workers, and job. But why say goodbye? Wouldn't it be better to say “Out of the office, will be back in a week”? 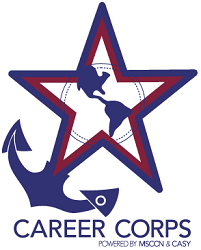 Volunteer and get work experience and professional skills development through CASY and MSCCN Career Corps Training Program.